These were sentiments of an expert in E-Learning, San­jaya Mishra from the Commonwealth of Learning (COL). 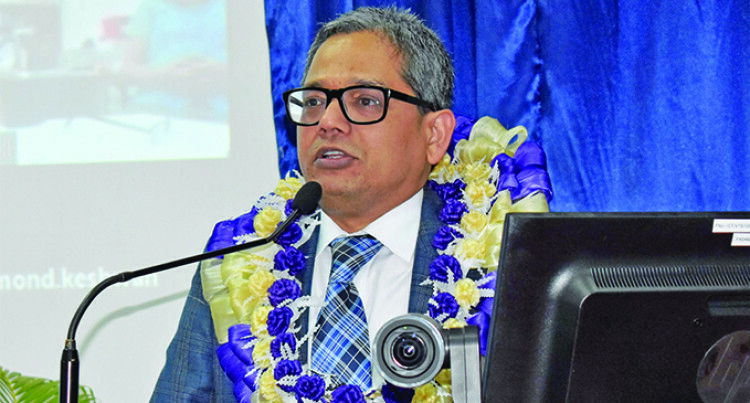 Education Specialist Sanjaya Mishra during a public lecture at the Fiji National University. Higher education institutions should now adapt to Open Educational Resources (OER) to contribute to the development of open knowledge. Mr Mishra has more than 25 years of experience in de­sign, development and management of open and distance learning programmes. He held a public lecture at the Fiji National University (FNU) Nasinu Campus on Monday, where he spoke on the topic “Open Educational Resources in the South Pacific”. He said OER has been adapted by many developed and developing countries globally. “Pacific countries such as Fiji, Australia and New Zea­land support the OER. These countries also have a na­tional policy on OER. Tonga, at the same time has also developed a draft policy in this area,” said Mr Mishra. “So the solution to all these problems is to encourage the open licensing of educational materials and encourage the development and adaptation of OER,” he said. Two major Open Educational Resources platforms are Wikieducator and OpenLearn. The E-Learning specialist also called on governments to support open educational resources in educational insti­tutions. FNU recently opened a $500,000 “Learning Commons” a digital library providing more interactive, collaborative and inclusive learning environment for students at its Ko­ronivia Campus.